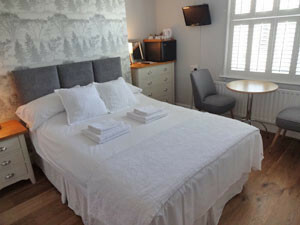 The Aquarium Guest House offers six contemporary and stylish rooms, all en suite and wi-fi enabled, and is situated close to the seafront and Brighton city centre. All bedrooms with flat screen tv’s and digital freeview. Window table and two chairs in all bedrooms. Real wood plantation-style shutters in all bedrooms. Hair dryers in all bedrooms. Radio alarm clocks in all bedrooms. Iron/ironing board in all bedrooms. Breakfast basket (fresh fruit, cereal bars and biscuits) and tea/coffee/chocolate included in price. There are a variety of cafes, delicatessens and restaurants, seconds away along cosmopolitan and vibrant St James’s Street. If a cooked breakfast is preferred, enjoy a wide choice in your own time and at a leisurely pace. Please telephone 01273 605761 or e-mail us at The Aquarium Guest House or check availability.